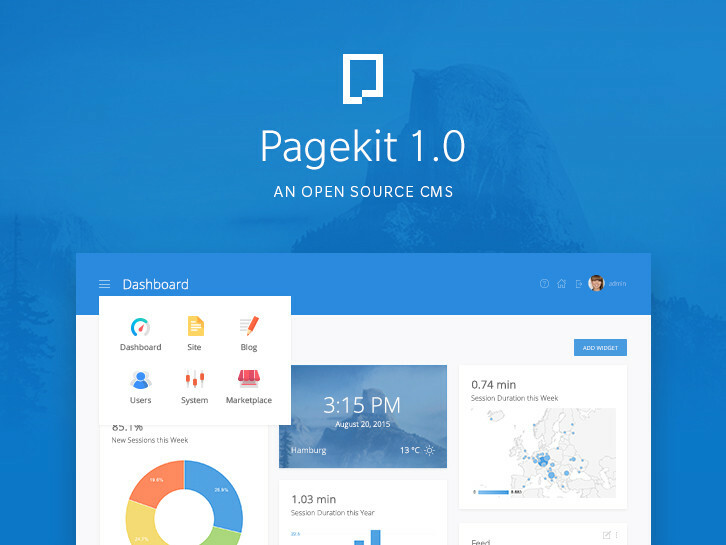 Pagekit is a lightweight open source CMS built with Vue.js and Symfony components. It allows users to create beautiful websites and offers a modern codebase for interested web developers. Pagekit features a user friendly admin interface, static pages, a blog and beautiful themes and extensions, which can be installed directly from the included Marketplace. What looks good on the interface level, should also extend to a strong foundation. Extensibility is one of the core ideas of Pagekit. On the code level, pretty much everything is a Module object: a theme, an extension, a widget and the core functionality itself. This keeps code complexity to a minimum, as developers can work with the same concept in many different places. Pagekit is extended through themes and extensions and manages them using the power of Composer. Install packages right from the browser, using the command line or by requiring them in your project definition. No need to distribute the package dependencies with your extensions. Pagekit will get and share the required libraries during the package’s installation. Pagekit is an Open Source project and is published under MIT license. It’s hosted on GitHub and open for everyone to contribute. I really like the concept so i will start using it, great stuff.